Wow what a day…….279 visitors + 10 children and 2 small dogs! came from all corners of Yorkshire it exceeded my expectations…….after lots of organising, volunteers, a couple of local charity publicity stalls, publicity, 80m of yellow bunting 100 yellow balloons, chairs and tables borrowed from villagers and my neighbours haulage yard acting as a car park (couldn’t have opened my garden without the car parking) my adjoining neighbour who baked delicious home made scones for the cream teas and served refreshments all afternoon. 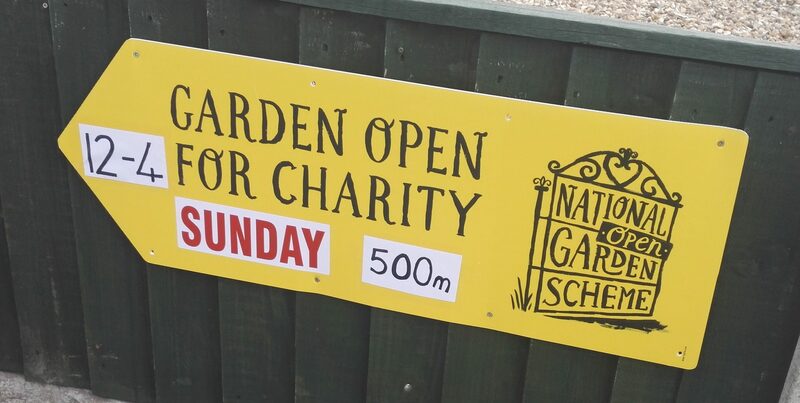 I was invited to speak on BBC Radio Humberside ‘The Great Outdoors’ gardening programme (on the Sunday morning) to promote my event and was asked by gardening expert Doug Stewart how I was feeling about opening for the NGS. I’ve got to say over the past 2 years I haven’t done anything special to my garden to prepare for the NGS opening my garden looks like this all the time but I am pottering in it almost daily. 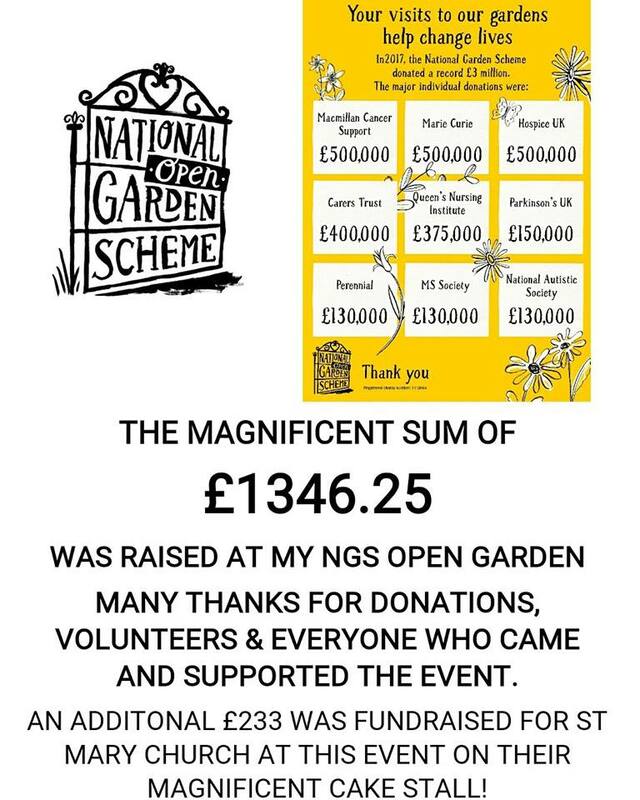 I was asked to describe my garden and how it has developed….and the preparations needed for the big NGS openday! It was only then that I was starting to feel daunted by what I had entered if but also very excited. The day before everything was brought together after a final mow of my lawns and it was time to start setting up I’d borrowed a large 8m orange gazebo from the vicar to cover St.Marys Church Fundraising Cake Stall so that was assembled and the bee keepers came over to setup their publicity stand and gazebo in the morning…. 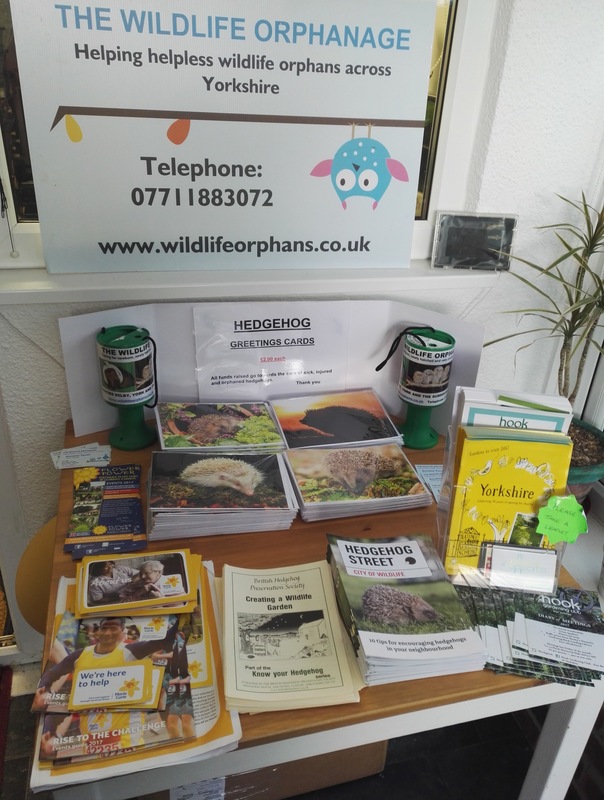 Plant stall was in situ and all plants being labelled, Hedgehog / wildlife rescue & general info stand in my conservatory was put up, Bunting was going up to guide visitors in from the car park to my garden as it was being accessed from the rear to keep all the traffic and visitors off the narrow village streets. 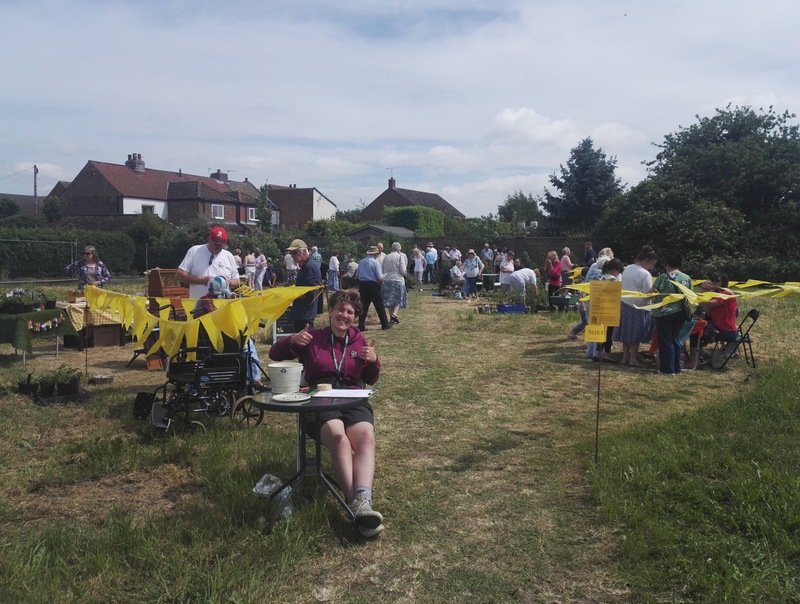 Chairs and tables for the refreshments were put around the perimeter of my garden so everyone could wander my garden with ease….and then the wind blew……….. to cut a long story short the large gazebo was no more and the lovely bee keepers display was blown across the field…. so the end of the day started like the beginning dismantling the buckled gazebo and due to the wind it was decided that gazebos and table umbrellas were a no go. I was running out of daylight by now and time to call it a day after a final run around the village putting up the last NGS yellow Arrows to guide visitors to my garden. Niece Grace taking the entry money her husband Joe did a fab job in the car park. THE BIG DAY WAS HERE……… I was up and early and on the FINAL countdown I wanted all volunteers ( who were manning the plant stall, taking gate money etc.) here and all other stalls ready by 11.30am incase of early eager visitors. Goole RSPCA, Barkston Ash Beekeepers arrived to set up their stalls. 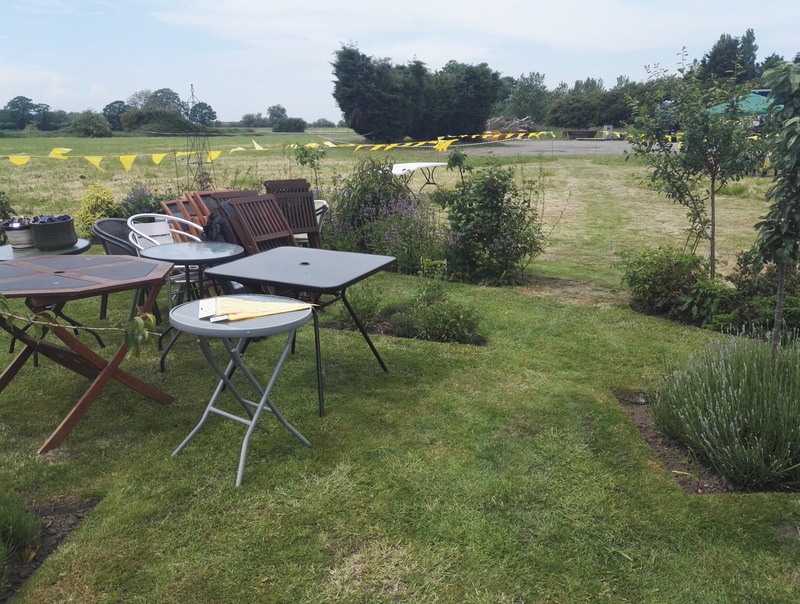 It was still very breezy but sunny so we decided against and parasols on the refreshment tables which no one seemed to mind as it was very pleasant sunny and dry as the first visitors arrived….. 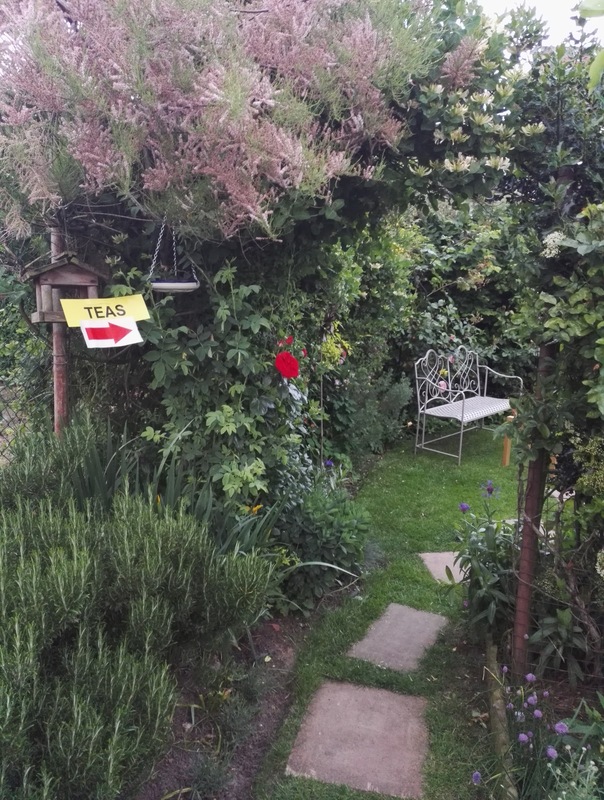 The car parking was working a treat … and visitors wandered in and they kept on coming my neighbour was run off her feet with her trusty helpers serving the delicious cream teas they were queueing around my garden all afternoon. I was receiving lots of lovey comments from the visitors as they were amazed I did my own garden without help. 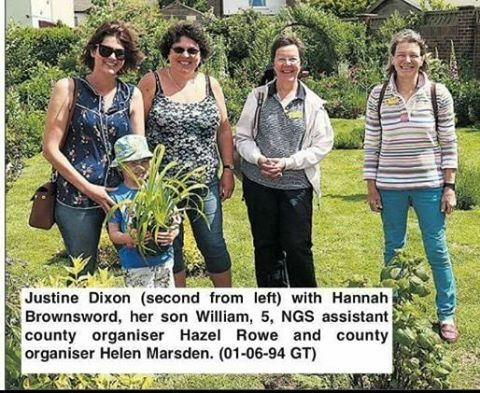 It was a lovely afternoon chatting to everyone even the East Yorkshire NGS county organiser came to visit and was very impressed with how the event was running. The Fundraising Cake stall sold out the Bee Keepers had a very good afternoon chatting and selling their honey to visitors. Goole RSPCA had lots of support and the Plant stall….. well everyone loves a plant and I had been splitting and nurturing cuttings from late summer last year in preparation for this event. Everyone was leaving with bags of cakes and plants returning to their corners of Yorkshire and before we knew it the last visitors were leaving and my garden was empty once again…..
Would I do it again… without hesitation but maybe not next year… so pencil in the last Sunday in May 2019. 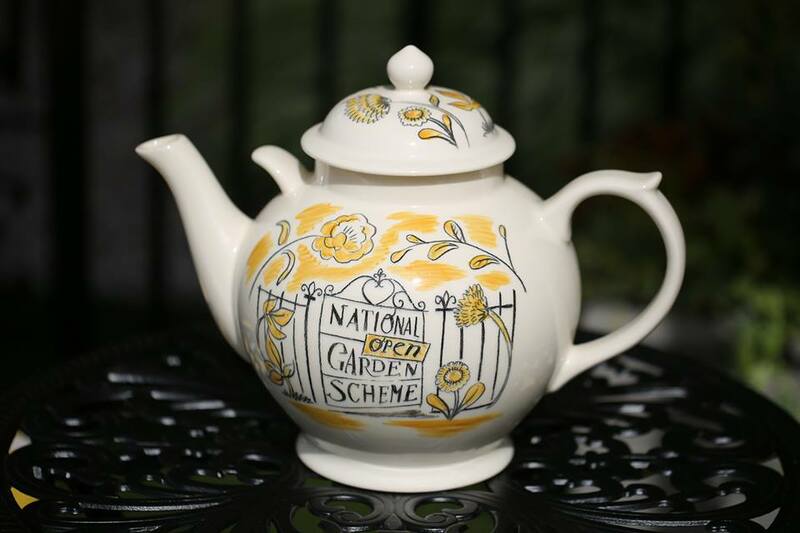 If you are thinking of opening your garden for the NGS GO FOR IT! Be aware that you will need volunteers lots of cake and tea, car parking essential (village hall car park or neighbours field) If you are still unsure please do not hesitate to contact me for a chat. Just want to finish with a BIG THANK YOU to my volunteers and Neighbours for the help and support for this Event.